When a new client reaches out to me to work together, it's usually because there's an eating behavior they're concerned with - bingeing, emotional eating, restricting, etc. These behaviors are driven by faulty beliefs. The belief that we have the power to control our natural set point weight. The belief that through diet and exercise, we can guarantee freedom from disease. The belief that weight is the most important determinant of health. The belief that we are more valuable if we take up less space. Changing behaviors is easy. Scratch that. It's easier compared to changing beliefs. 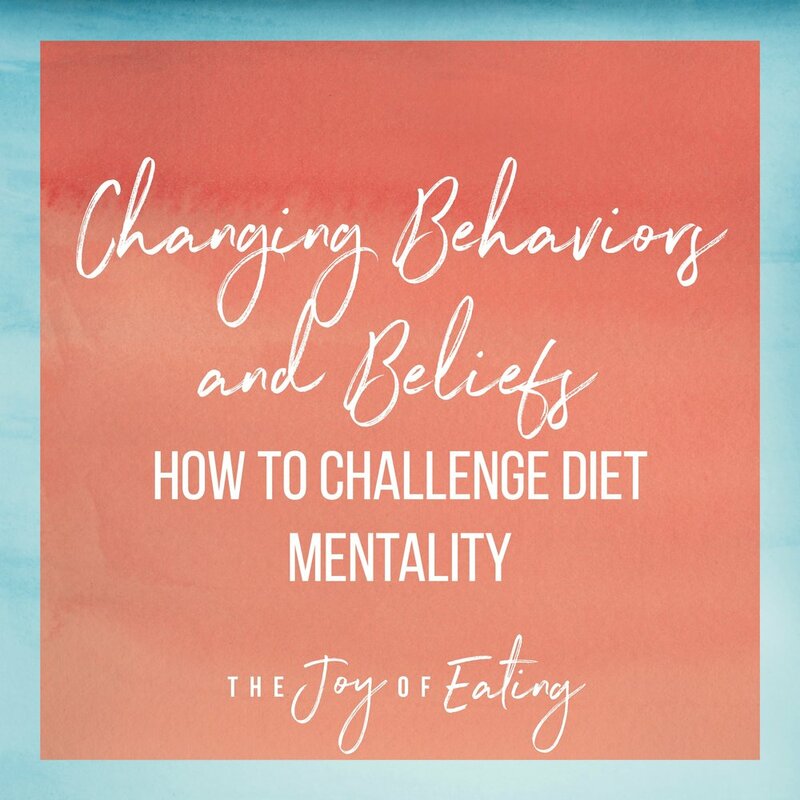 In working with someone, usually we start by addressing behaviors because that is an easier entry to healing your relationship with food and your body - and because our brain has a lot more mental energy to change thoughts when it's fed adequately. We can make sure you're eating enough throughout the day to help prevent bingeing and overeating at night. We can explore other ways of coping with emotions outside of food. We can add previously restricted foods back in to your diet. These are behaviors we can address, even if you want to change your body. But of course, the real change comes in when we change beliefs. When you know that thinness does not equal value, and that there's a lot more to health than food and fitness, you'll start engaging in behaviors that reflect those beliefs. Making decisions on how to take care of our body and mind become easy. 1. Educate yourself. Read books like Intuitive Eating, Health at Every Size and Body Respect. Follow non-diet dietitians and therapists on social media. Listen to podcasts like Food Psych and Nutrition Matters. Read the work of fat activists like Virgie Tovar, who can help you understand why we need to reach beyond our own personal body positivity and fight weight stigma in society. 2. Identify diet mentality and challenge it. Get in the habit of noticing when thoughts rooted in diet mentality arise - and challenge them! This is where mindfulness can be helpful, in noticing a problematic thought and challenging it rather than ruminating on it. 3. Have a non-diet bubble you can retreat to and avoid triggers. Triggering diet talk can be extra harmful when you're in the midst of changing your beliefs. It's helpful to have a little bubble you can retreat to, whether it's supportive friends, social media that's free of weight loss talk, or yourself, with a book that has nothing to do with food or body image. As you work on changing your underlying beliefs, be sure to pack a little self-compassion. This is hard work, challenging ideologies that have been instilled in you from a young age. Don't be afraid if some days are easier than others. Remember, your body is constantly changing, so this is a lifelong process!